Tuition, Workshops, Play Events and Parties. Sharing skills and encouraging creativity is what makes the world go round. I have a great deal of experience in guiding people of all ages and abilities towards their own style. Groups or individuals are welcome to come here – seeing the Studio lay-out and work-in-progress is part of the event. Or I can bring everything we need to you. The Workshop will be custom made to suit your needs. 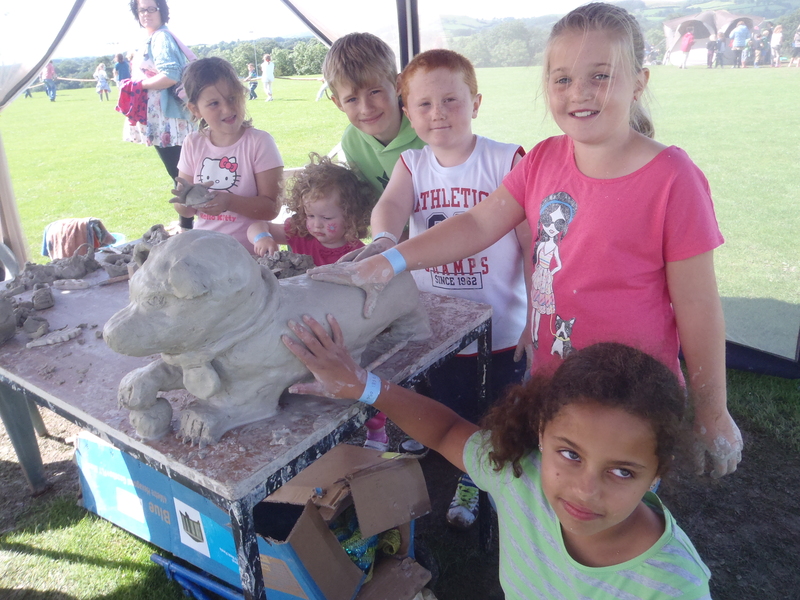 -I particularly encourage Teacher’s to do a fun, very straightforward 2 hour Workshop on Using Clay Modelling in School. We’ll cover firing/ self-hardening clays,recycling clay,decorating and controlling costs, everything to help you keep clay in the class room because it matters! -A Portfolio Review will clarify the way you see your work in preparation for college applications or a change of direction. -‘How To ‘classes with technical solutions for challenging projects,especially working on a large scale. 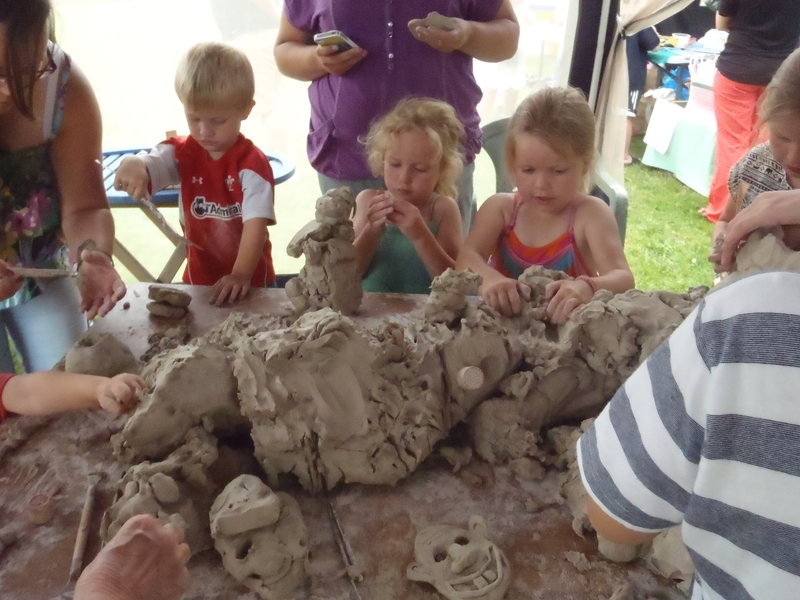 Join-In Sculptures are great fun and full of learning opportunities. It is a wonderful way to get Groups to explore ideas and themes. 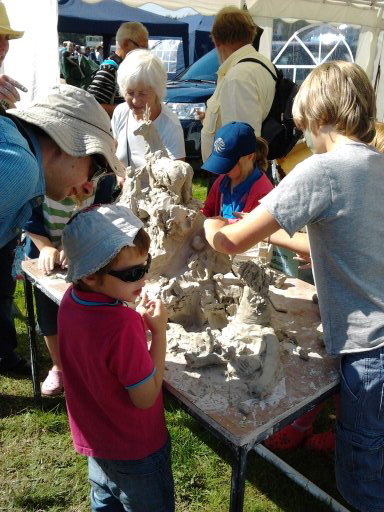 I have done these with adults and children at Schools, Events and Parties; Everyone adds their bit until we have a fabulous sculpture. Photos are taken and then we re-cycle the clay. 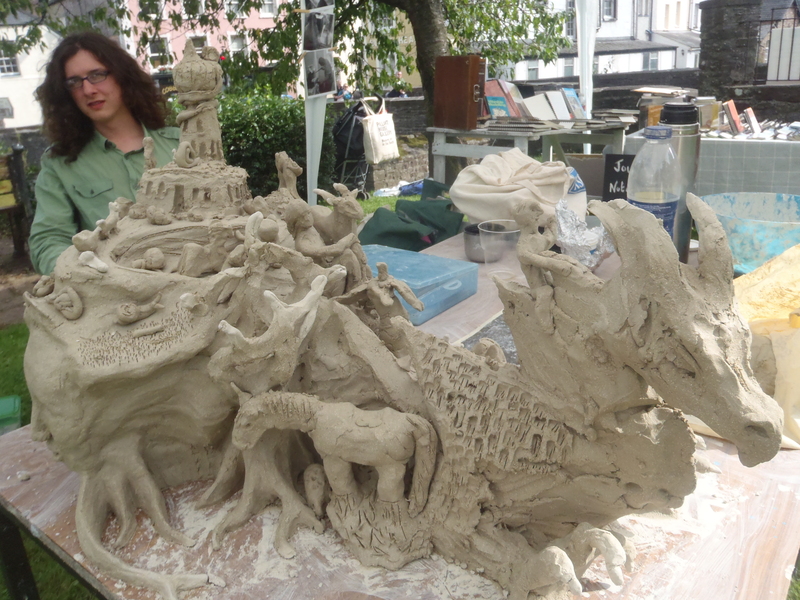 A Join-In Sculpture with The Big Skill at Archaeology For All in Merthyr. This fantastic 3 metre x 2.5 metre painting was done with many kids at the Penrhos Youth Centre over 6 weeks. £25 per hour + 44p/per/mile Travel + materials .On average Individuals will use around £2.00 worth of clay. On many projects , like the Join In Sculptures,all the material is re-clycled so there is no charge for it. The measuring frees you up to be expressive with your modelling. Concrete skills set your creativity free. Osprey Studios has a major commitment to sharing skills and encouraging creativity. I have a great deal of experience in guiding people of all ages and abilities towards their own style. 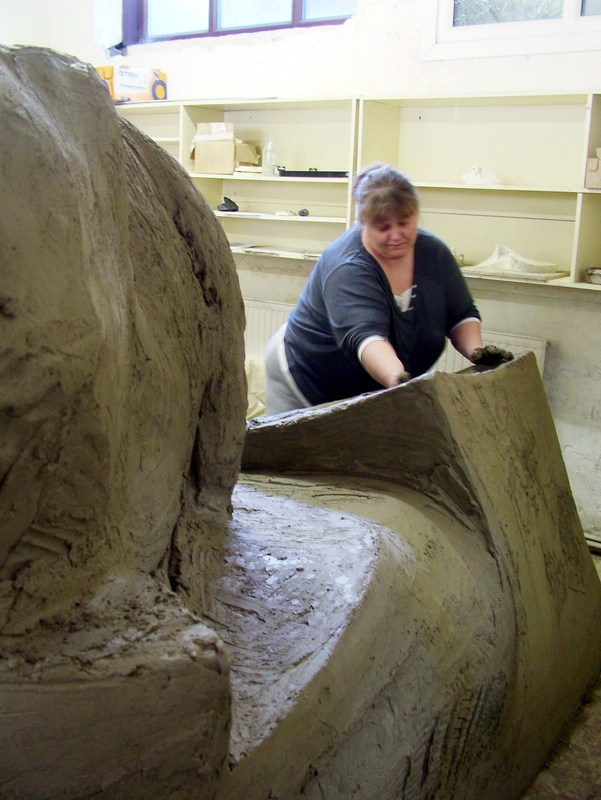 My sculptural techniques have been tested to destruction and make sound foundations for your own exploration of clay and form. You can find my set of ‘How To’ posts here. I update and add to them regularly and get a big kick out of the fact that they are now used all over the world. From time to time I’ll run a Master class here on a particular thing; Posts about Workshops. If there is something you want to work on let me know and I’ll collect together a group of like-minded people and we’ll set a date that works for everyone. The price is usually around £90 p/day each for a 7 hour day, with a max group size of 8, including home-made lunch and refreshments. Only materials or tools kept are extra. A Masterclass at your venue can have more students than that depending on your resources. Monmouth School A level students 2 day Workshop with Rebecca Buck. Mount Street Junior School, Years 3 and 4 making a model of a town that cares for and supports it’s Military members. Paddling can clarify your shape: it’s really satisfying. Gwalia Mynydd Mawr Home. This lovely man couldn’t speak any more but he drew beautifully and loved clay. Primary School children visiting the Care home for lovely afternoon of creative fun with Residents and carers. There was lots of singing, laughter and sharing. The residents lit up and the children were relaxed, charming and really enjoyed supporting their elders. Work all around the form in stages, giving each area equal attention, refining with each rotation. Walk away from your work and look in detail at something out the window ; this will ‘clear your eye’. Turn and look at the head; what is the first thing you notice? It might be an error you couldn’t see when you were up close and immersed in the work. Or it might be that it looks way better than you expected. Groups or individuals are welcome to come to Osprey Studios (SA9 1YT). Being in the Studio environment with work-in-progress and the sculpture garden outside is part of the event. I usually provide homemade refreshments and lunches (included in the fee) and we have relaxing breaks on the sofa or in the garden to swap ideas and chat. There is accommodation available here or lots of other gorgeous places to stay and eat in this lovely area. Or I can bring everything we need to you in my van. 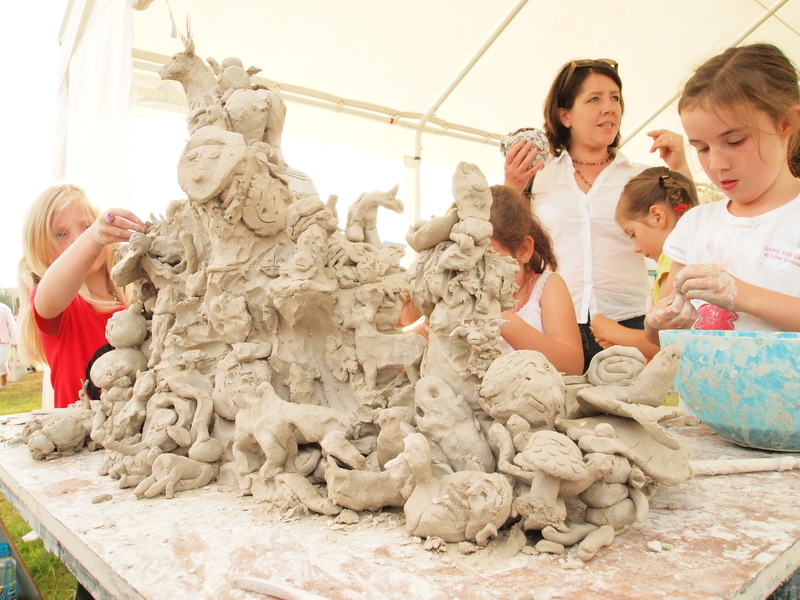 Sculpture in clay makes surprisingly little mess and is easy to clean up. The Workshop will be custom made to suit your needs and objectives. 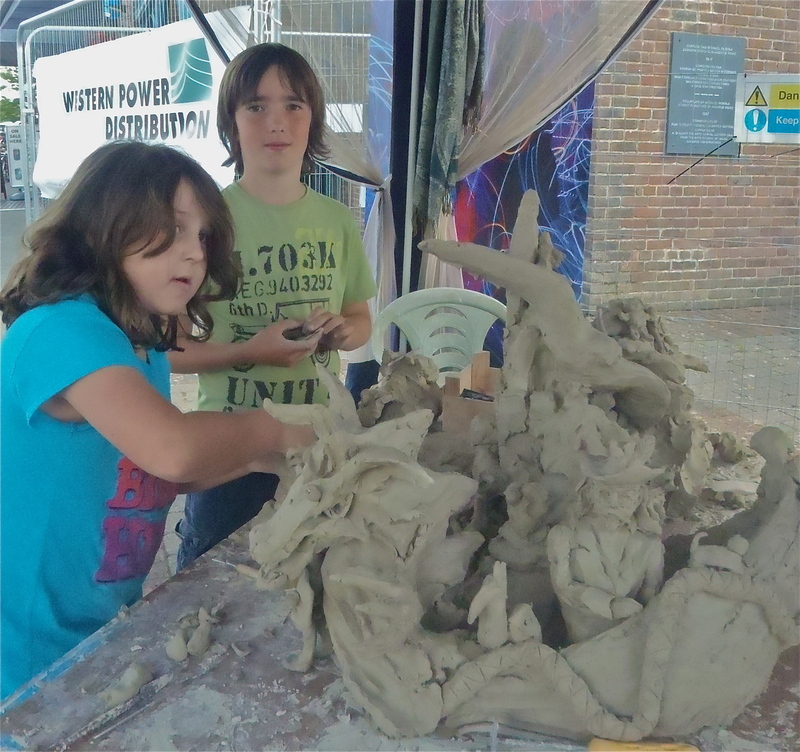 A 1 day workshop guiding you towards your own ‘voice’ in 3D artwork. 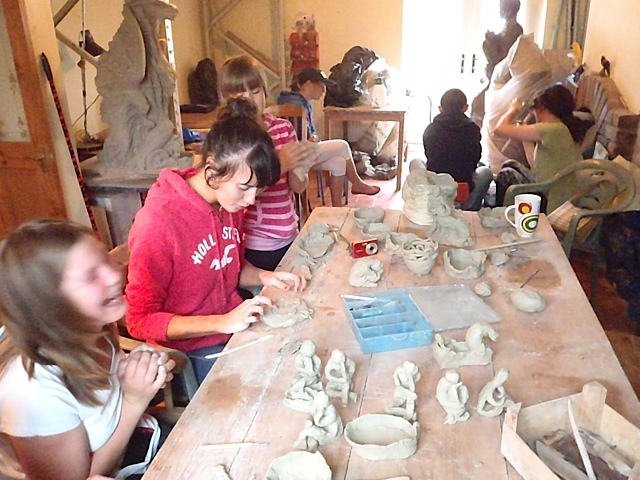 A very enjoyable, fascinating day with lots of laughs and new experiences in clay work whatever your starting point. Making figures: a 1 day workshop incorporating a great deal of very useful information relavent to all sorts of artwork. 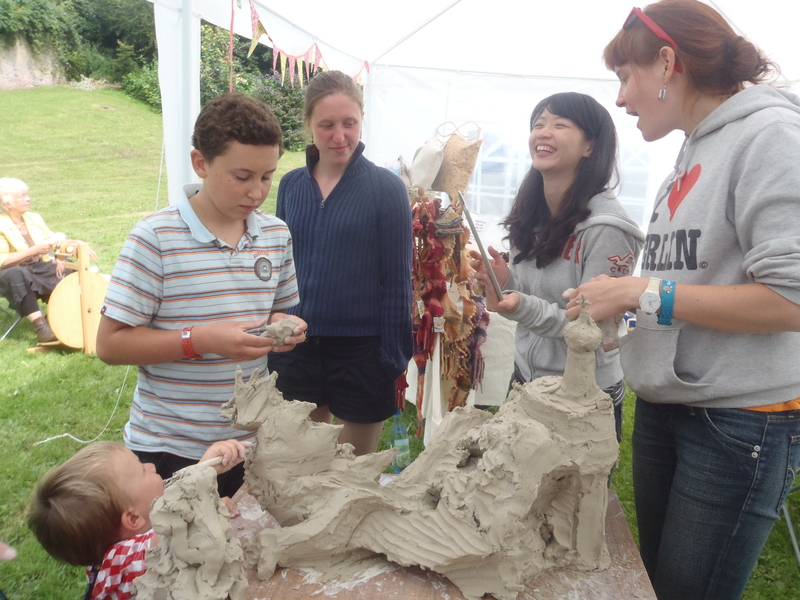 I particularly encourage Teacher’s to do a fun, very straightforward 2 hour Workshop on using clay modelling in school. We’ll cover firing/self-hardening clays, recycling clay, decorating and controlling costs, everything to help you keep clay in the class room because it matters! A Portfolio Review will clarify the way you see your work in preparation for college applications or a change of direction. 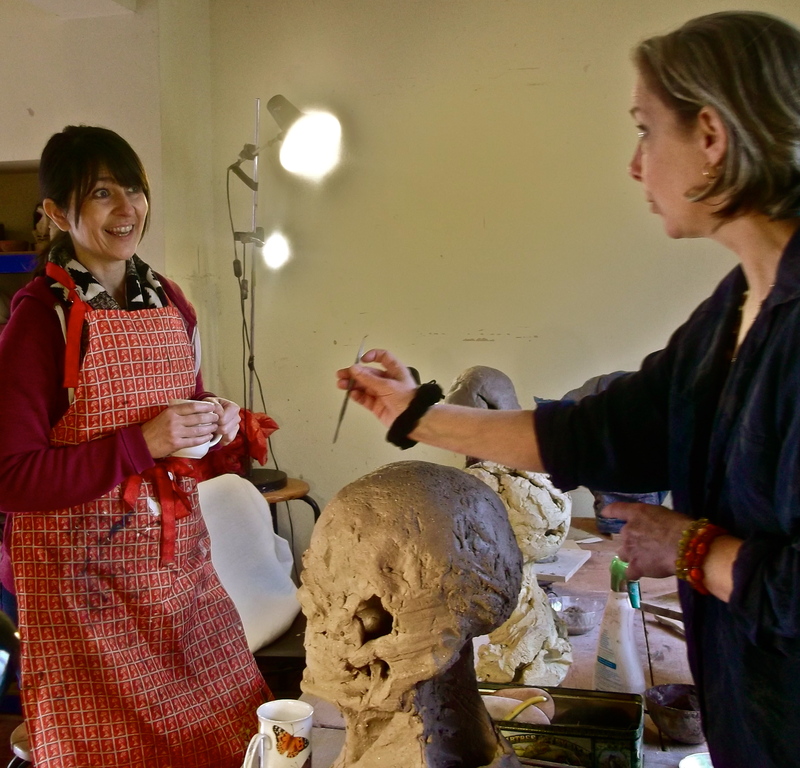 ‘How To’ classes with technical solutions for challenging projects, including working on a large scale, hand-building pottery, drawing from life, portraits/figures, all suitable for all levels of experience including total beginners. 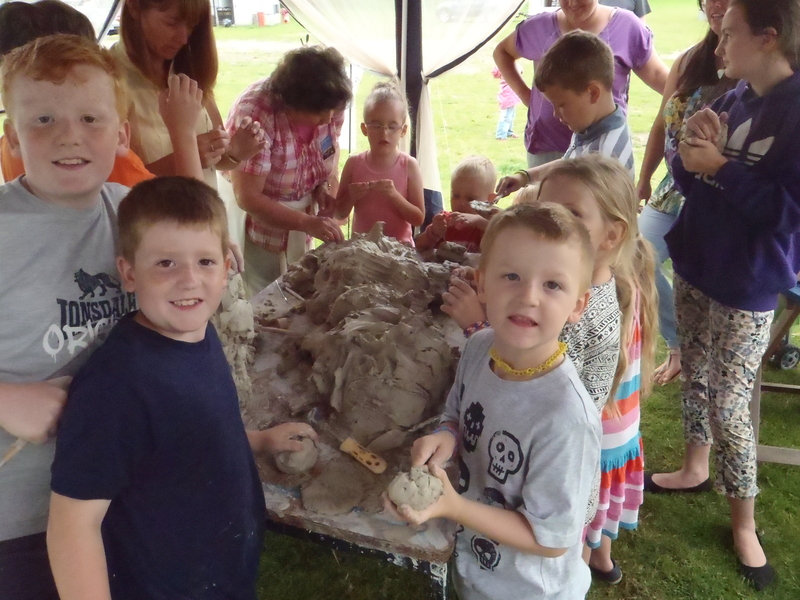 Join-In Sculptures are great fun and full of learning opportunities. 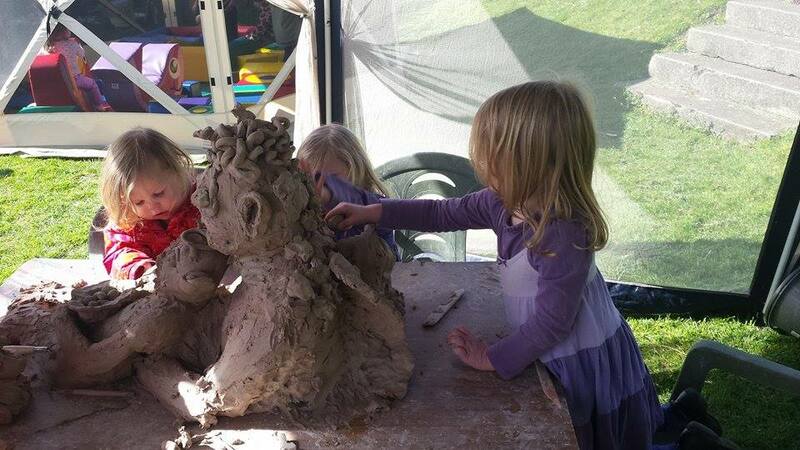 They are the ultimate embodiment of unstructured, experiential, messy play! I have done these with adults and children at Events and Parties in all kinds of settings and they bring out the best in everyone. 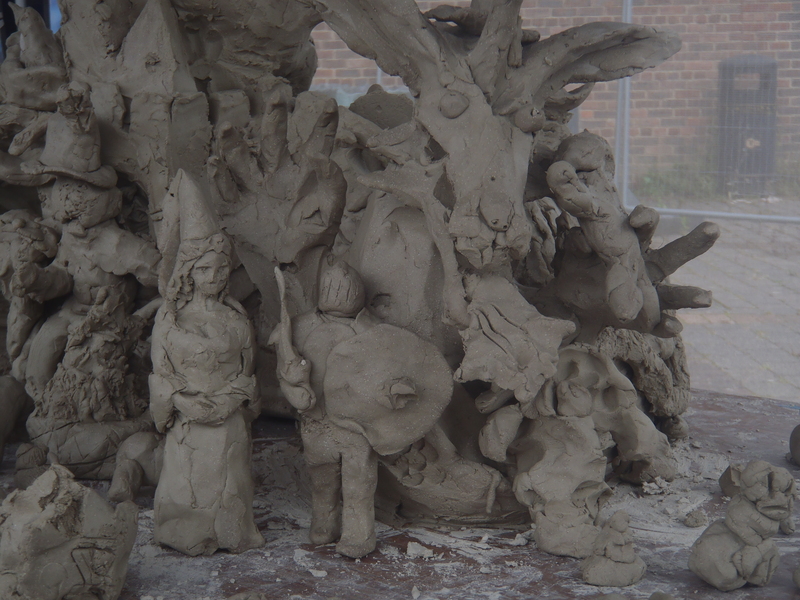 The fabulous, ever changing sculpture is photographed along the way and then we re-cycle the clay. It is a wonderful, flexible, cost effective way to engage and inspire even very large groups ( 80 year 2’s over 1 day is my best yet) and great for working through themes, building concepts and stories and engendering co-operation. No matter how small the contribution it is part of something greater. Occasionally I’ll go for other materials and processes like drawing or murals. 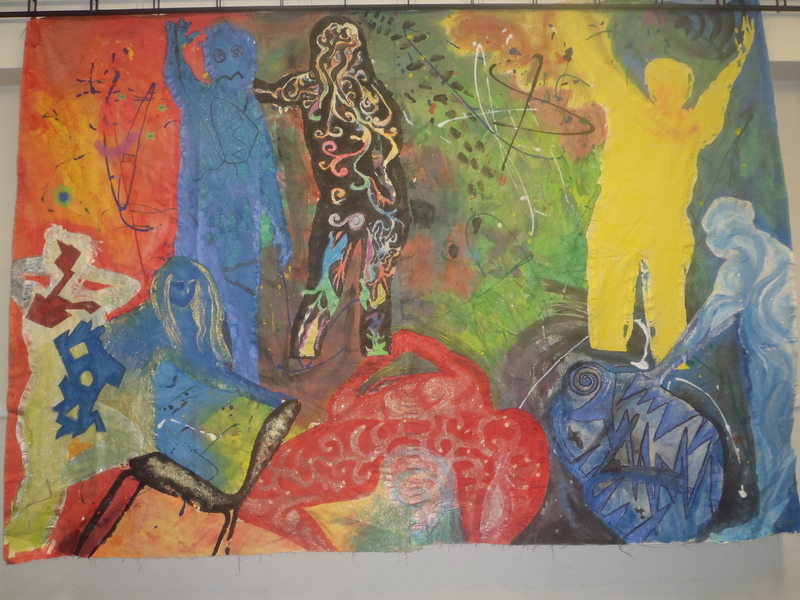 This fantastic 3 metre x 2.5 metre painting was done with many wonderful young people at the Penrhos Youth Centre in short sessions over 6 weeks. The book we made: The People Of The Throne. This magical book to go in the Library was part of a sculpture project with year 5 at Pennard Primary School on the Gower. Fees start at £30 per hour + 44p per mile travel + materials. On average individuals will use around £2.00 worth of clay. On many projects, like the Join In Sculptures, all the material is recycled so there is no charge for it.